It reminds that motivation doesn’t just happen, it’s something we have to work at. Along with my Short Ribs in Red Wine and Port recipe post, I discussed being forced to challenge my rather limited beliefs I held about creativity. I honestly thought creativity was about the ability to paint and decorate, and therefore confidently declared myself ‘creatively challenged’! On my journey to redifine my thoughts on creativity, I stumbled across another deeply held yet totally ignorant assumption I had. I thought if you were creative, your creative ability oozed out of you. Seriously, I pictured creative people standing in front of an empty canvas and their art just flowing out of them. It started to dawn on me that I had made many half-assed assumptions about what creativity meant! But I am sharing this because this relevation was a huge turning point for me. I not only realised that creativity took many shapes and forms, I finally understood that creative people worked hard at their art! Now I realise that these people are good at what they do because they make themselves do it. They don’t live in a constant state of motivation, they’re just persistent and consistent at their art. That’s why I like Zig Ziglar’s quote. It sums up perfectly what I’m trying to say, creativity requires motivation to produce art! Whatever your art may be! 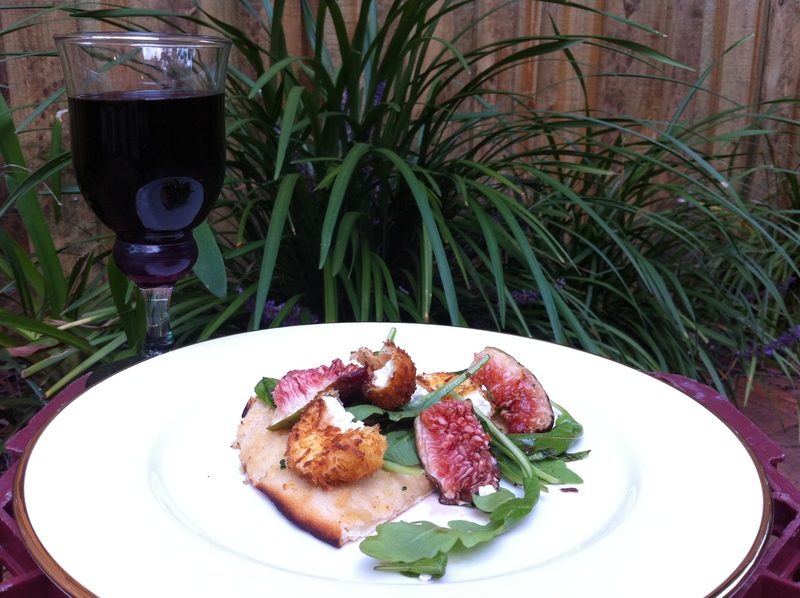 I saw this recipe for Fig & Fried Goat’s Cheese Salad with Balsamic Syrup and honestly, while I wanted to eat it, after another hectic weekend, it was the last thing I wanted to make! But these days I’ve learnt to focus on how I’m going to feel after the work is done! So in no time I was cutting, whisking, dipping and frying! 1. 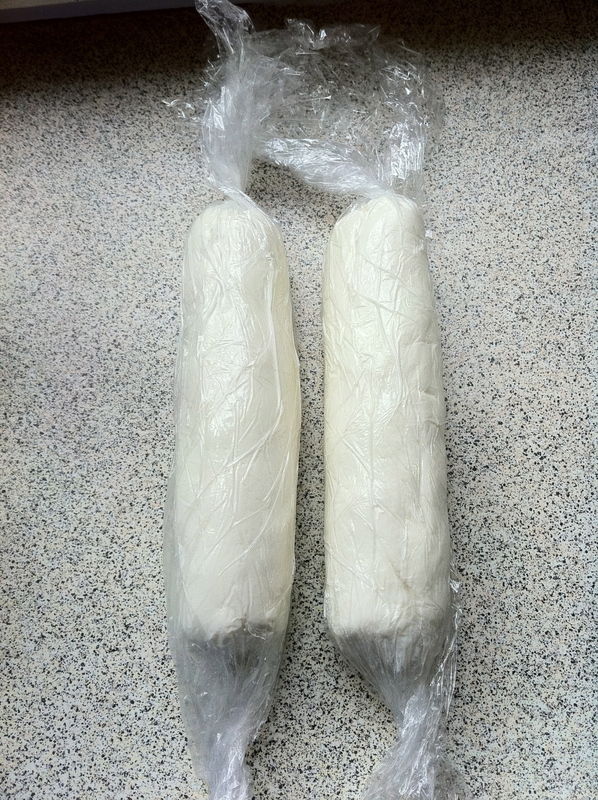 Wrap logs of cheese in plastic wrap roll into even log shapes. 2. Place flour in one bowl, the beaten eggs in another and the breadcrumbs with lemon zest and 1 tsp salt in a third bowl. 3. Unwrap cheese and cut each log into 12 slices. The recipe recommends greasing your knife (and so do I!). 4. Dip each slice into the flour, eggs and finally the breadcrumbs. 5. Place on a tray and refrigerate for 20 mins. 6. In the meantime put balsamic vinegar and sugar in a small saucepan and cool over low heat for about 3 mins or until sugar dissolves. 7. Toss rocket with olive oil, season with salt and pepper and top with the figs. 8. Fill a saucepan or deep fryer about 1/3 full with vegetable oil and heat over medium heat until a cube of bread turns golden in 10 seconds. 9. 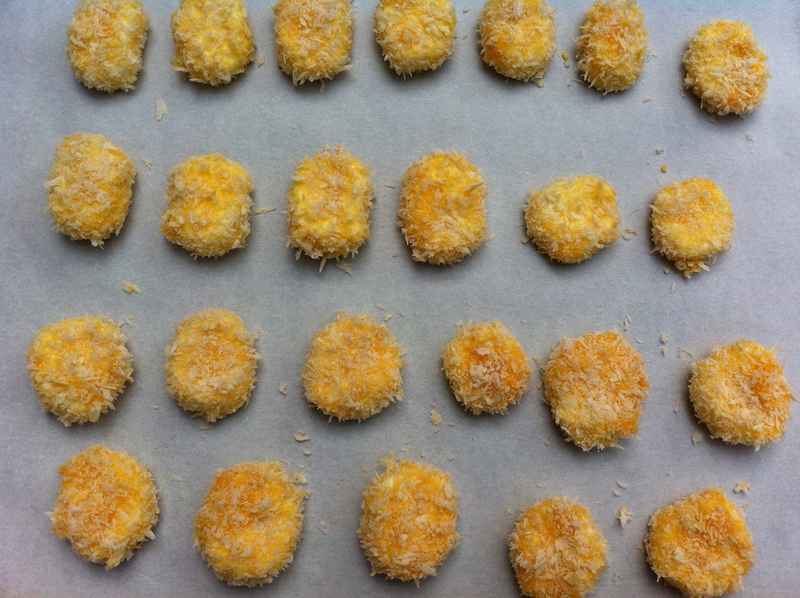 Lower crumbed cheese into oil and fry until golden. Remove with slotted spoon and drain on paper towel. 10. Top salad with fried cheese and drizzle with balsamic vinegar. I really loved this salad! I meant what I said about being totally exhausted! Saturday she went camping with her friends (and some of the parents) while we went to a 40th. The 10 year-old had a sleep over at a friend’s and our 3 year-old spent the night with grandparents! By Sunday night we were all exhausted so we ordered some woodfired pizza for dinner and I made this as the side salad. When my husband arrived with our pizza, I took one look at the garlic pizza crust and loaded it with the salad. I didn’t even taste the other pizzas! Tags: cooking, creativity, food, happiness, inspiration, life, life lessons, meaning, motivation, my life, personal, purpose, recipes, salads, thoughts | Permalink. The cheese fritters sounds amazing. 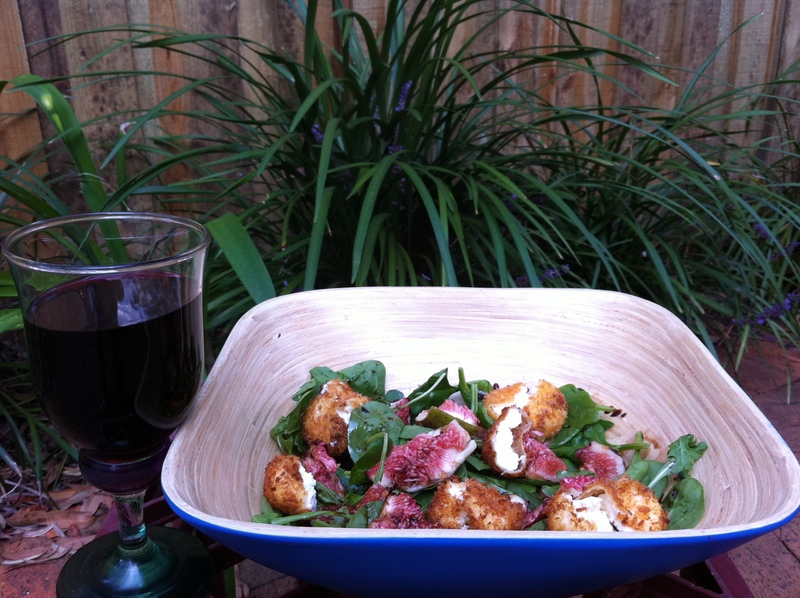 And I spied a glass of red – great complement to the salad! I can’t say enough about how well it all went together! This salad looks so pretty and absolutely delicious! Great post! This combination looks fantastic! The salty tartness of the goat cheese should taste amazing against the sweet figs. Great post! The flavours constrasted perfectly and the balsamic syrup just took the whole thing to a whole new level! What a great post! And a great recipe. Terrific idea about adding it to the pizza as a topping. It looks wonderful. I have fig envy! Fresh ones never seem to find their way to this neck of the woods. That salad looks absolutely lovely. Nice post as well. My Karate Kid has a major talent for drawing – but she will draw and redraw and redraw the same picture over and over again until it is good enough in her mind. When you see her final work, you would never know how much effort she put into what seems to be a simple sketch. But to her, it’s worth the effort! It sounds like you are on the right track to get to where you need to be as well! Hang in there. Love your take on creativity and the scrumptious recipe! A glass of red wine makes for a wonderful meal as well 😉 Hope everyone enjoyed their outings this week. Have a good one! 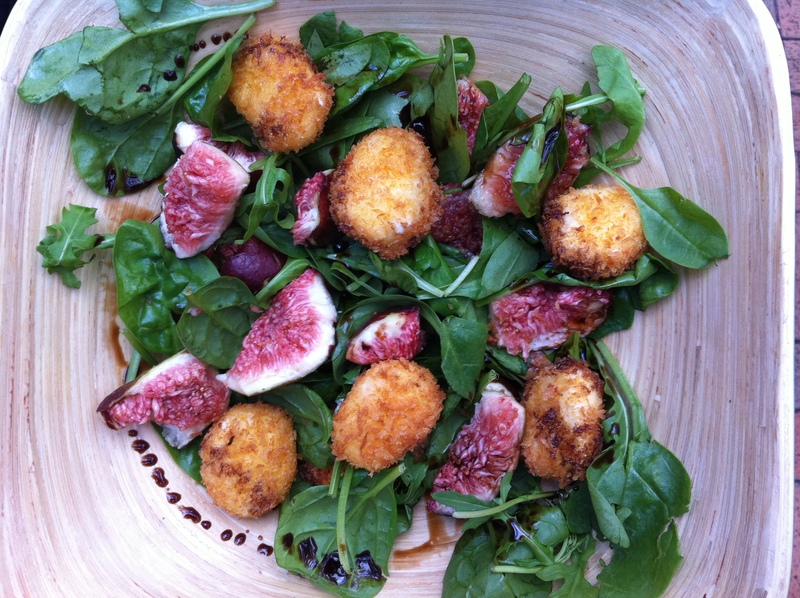 ooh fried goat cheese, I could eat a whole platter of those :-] Can’t go wrong with figs + fried food! This is a wonderful post! I thoroughly enjoyed every bit… and it’s so true what you say… we all have to work at whatever it is that we want to accomplish. This looks so good, I really want to give it a try.